Inspiring Ideas with artist Jeanne Winters: Keep Your Eyes Peeled Here! Keep Your Eyes Peeled Here! Exciting news! I am 2 days away from my 1 year blog anniversary!! WooHoo!! Naturally, a contest is in order ... I have a giveaway of epic proportions in the works!!! ... where I was featured today!! Yeah! Thank you, Kim!! Anyhoo, I wanted to be sure y'all come back on the 12th to get in on the action!! Prepare to be dazzled!! Ok, I swear I wasn't drinking when I only saw a couple of pages for your blog.....And I thought I had been here before and was so confused. Well, so glad there are more pages for all of us to browse through. Congratulations on the new award AND one year! I followed the link from Kim's blog and glad I did! I love the inspiration board. I immediately showed my husband and he thought it was cool too. Now I'll be on the look out for discarded doors that are in good shape. I'm going to do a quick post on my blog about it. I really love browsing your previous posts. I'm adding your blog to my reader! I actually found your blog last week, sort of by blog-hopping, and bookmarked it. I love your style, and congrats on being featured at Kim's! What a fun blog! I'll def. be back! Congrats on the "one year" and many more to come! 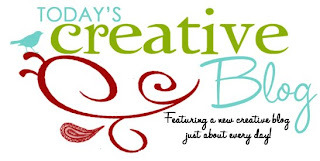 I came over from Today Creative Blogs and I was impressed! I love the sillhouttes that you made I have been wanting to do that for awhile now. Great stuff! I honestly don't remember how I found you (funny how that can happen) but I was so happy when I did. You have a delightful blog. I found your blog a few weeks ago blog hopping too! I added you to my Inspiration list already. Loved the cute V-day ideas. Congrats on the award!!!! Comin over from TCB- congrats on being featured and your one year mark coming up!! Love your style- can't wait to look around some more! I will be back for sure! Your print of "everything is beautiful in it's time" is one of my favorites! An early congratulations for you for your anniversary....and a big congrats for getting on at Kim's lovely blog! Yay for you! I always look forward to your posts. Can't wait for the contest!